I have a newfound appreciation for squirrels after this weekend. Before, I was never a fan of these rodents. I dissed them here on this very blog. 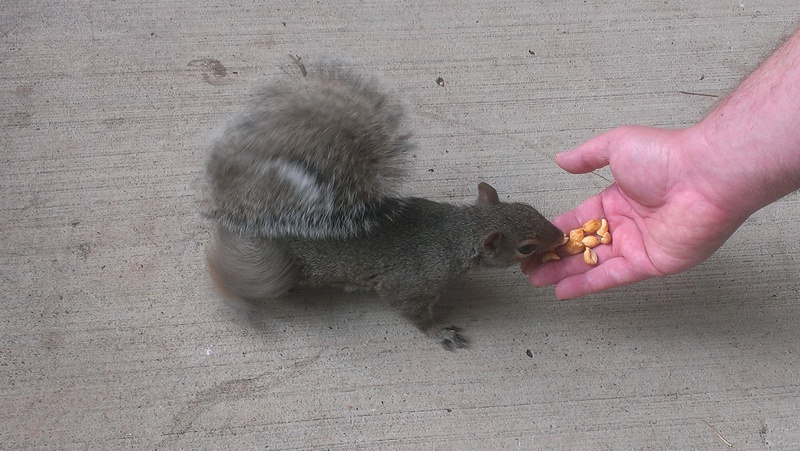 Called them “rats with bushier tails.” One blogging friend, Ron, happens to love squirrels. I always thought he was nuts (pardon the pun), and did not see the appeal. My beef with the critters began when I hung a bird feeder, and had to deal with the pesky little varmints stealing the food intended for my feathered friends. 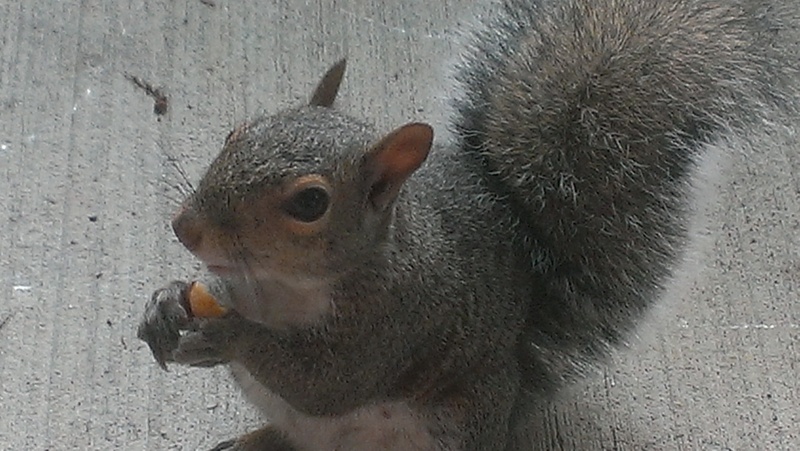 Bird seed ain’t cheap, and I didn’t appreciate shelling out all this dough only to have it stolen by squirrels. So I began chasing them away from the feeder anytime I caught them in the act, even going so far as to squirt them with a water bottle normally reserved for my cat, whenever she breaks the house rules. Couple that with the fact that a squirrel got into my grandmother’s house through a chimney once, several years back, and wreaked all kinds of havoc, apparently chewing things up and causing damage. An exterminator was called in, I believe. Maybe now you can understand why I wasn’t fond of the creatures. Yesterday morning, I glanced outside and found a squirrel practically doing contortions to get to the sunflower seeds in the bird feeder. Not cool. As is my custom, I threw open the screen door, and ran at him, shouting and waving my arms. Only, he didn’t run away. In fact, he was so casual about the whole thing – he stopped eating and calmly made his way down the patio beam from which the feeder is suspended – that I easily could have grabbed him. Which has always been a secret fear of mine. What happens if you chase something and it doesn’t run away? What if you actually can catch it? Then what? If I grabbed the squirrel, it might have bitten me. It could have been rabid. We might have had a Cujo situation on our hands, which would’ve sucked less than a week before the wedding. I’d hate to be reciting my vows whilst foaming at the mouth. So I skidded to a halt and just stared at the creature, having no idea what to do next. Whoa. This is one brave squirrel! And then, this wild animal – who was unexpectedly trusting – actually approached me. I think I took a step backwards at that point, confused. There’s a delicate balance in the battle of man v. nature, and we are supposed to be top dog. This brave little squirrel didn’t get the memo, leaving me hesitant. He came right up to me, within inches of my foot, and looked up at me with dark and pleading eyes. Remember when The Grinch had a revelation, and his heart suddenly grew three sizes that day? In that moment, that’s what happened to me. “Quick dear, grab my nuts!” I called excitedly to Tara. Displaying absolutely no shyness and not the slightest bit of fear, the squirrel fed repeatedly from both our outstretched hands. I found it all pretty remarkable, and a little thrilling. I’d never fed a beast of the wild with my bare hands before. I felt a oneness with nature in that moment, like I was connected with the universe on some sort of higher plane. And I stopped hating squirrels. I mean, how could you? With a face like that?! Look at the little fella. His trustworthiness was rewarded with a literal handout, and for one morning at least, he went away with a full belly. He came back a couple more times while I was sitting out there enjoying my coffee, dancing around my feet again, hoping for more food, but I didn’t want to spoil him. He was back again this morning, too – he came right up to the screen door and peered inside, to the consternation of my cat, whose flattened ears and twitching tail belied her desire to take a chomp out of our newfound friend. Or, more likely, she’d be like me when I caught up to the squirrel, and didn’t have a clue what to do next. It’s hard to say whether feeding a squirrel by hand was the highlight of our weekend, or the 8-mile bike ride Tara and I embarked upon Saturday morning. We’ve both got bikes that have been hanging up in the garage for over a year, gathering dust, unused. I hadn’t ridden mine in years. We’d talked about hitting the bike path along Burnt Bridge Creek for some time, but always found excuses not to go. Fresh out of excuses and eager for a bit of fresh air, we loaded the bikes in the back of my SUV and hit the trail. It’s a nice, long concrete path that follows the course of a meandering creek for miles, through wetlands and soccer fields and apartment complexes and even, at one point, a cool swath of forest. We had a great time, and look forward to doing it again. Once the weather decides to cool down, we should have plenty of opportunities to do so. In the meantime, there’s only one thing on our minds: the fact that we are getting married this week. It’s not every day you can make that statement. “Unless you’re my ex-husband,” Tara said, and that might just have been the zinger of the year. And it’s true. He’s up to wife # 3 now. They just keep coming out of the woodwork. Whatever. That’s his cross to bear. All I care about is: 5 more days!! “And I stopped hating squirrels. Okay Mark, you must know HOW MUCH I enjoyed this post, right?? OMG…you’re a born-again squirrel lover!!!!! These photo are adorable. 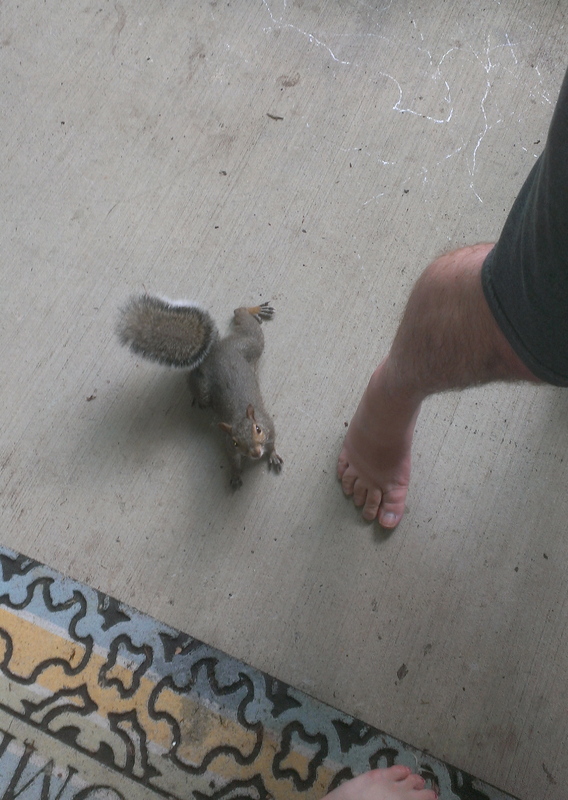 Especially the one of you hand-feeding him nuts! Honestly, it actually made me a bit teary-eyed because it’s such a sweet picture. I hand-feed them in the park as well, and I’ve never once been bitten. Never. Way to go, Mark! You made me very happy! ““Quick dear, grab my nuts!” I called excitedly to Tara. And 5 more days! Yippeeee. I am so excited for you and Tara! I knew you, of all people, would appreciate this post, my friend. What can I say? My heart has softened. I am, as you declare, a “born-again squirrel lover”! The squirrels where I went to college were like that – they were super trusting because they were so used to people being around. Thanks, Sarah! Before you know it, you’ll be taking that march down the aisle, too. Not that there’s an actual aisle in our case, but it’ll serve as a perfectly decent metaphor. I like the pic where he’s standing next to me, looking up. I couldn’t believe it was happening even while it was happening! Of course, you’re nuts! Still–great title–and fabulous turn-around. Think you could ever love a pigeon? Still, someone’s gotta be the Squirrel Whisperer. Might as well be you! Hope you all have an amazing week. Congrats to both of you! Thanks, Chris! I’ll be on the lookout for any telltale signs of rabidity. You have to watch out feeding wild animals–I once got bit by a kangaroo while trying to feed him. Made a good story though when we got back from vacation. I love this comment, because you just throw it out there so casually. I got bit by a kangaroo. Not many people can say that, mom. It’s such a great story! Hilarious post. My husband and I are in a constant battle over the squirrels in our yard. I love them–he hates them. I feed them–he plans their demise. I have a couple of squirrels that have gotten into the habit of staring in the window to get our attention, even knocking on the front door. I swear. And the cats, at least ours, are all hiss and no bite. They chase the little guys until they they are within striking distance and then let up so the squirrels can get away. They do this repeatedly. Every day. Like their own game of cat and squirrel. Your squirrels knock on your door?! Clearly, I need to train my newfound friend, lol. I’ll bet anything my cat would do the same thing as yours. OK…I’m about to catch him…now what do I do with him?! Okay, I don’t know if he knocks per se. He must jump into the door? and scratch at it? I don’t know. I can’t see him. But I can hear it when I am working at the computer. And when I open the door there he is, waiting for a treat. I’m not going to jump on the bandwagon and tell you how great squirrels are because they are in fact, a RODENT. Little beady eyes and cute bushy tail and all…a rodent is a rodent and you won’t convince me otherwise. Good luck getting rid of it now. So excited for this weekend!! It’s been months since we’ve been ANYWHERE and to go to my daughter and her honey’s wedding…well…what can I say? See you in 5 days, future son-in-law! Rodent, shmodent. They sure are cute! I’m glad you’re looking forward to this weekend. We are, too! I can’t wait for everybody to meet and hang out and have a good time. It’s going to be a blast, future mom-in-law! You know, I’ll bet – with patience – you could hand feed crows too. I know! Exactly why I don’t care that he’s technically a rodent. That fluffy tail is so damn cute. They tame and learn quickly and you will see each seems to have individual personality. I was able to coax them in a week or so from back porch to bedroom, then to hall, then to living room then to kitchen. Sneaky would grab a peanut and run, Greedy would take a peanut only from the paws of another, Dummy would run in and run out with nothing, Picky would shake several before choosing and they all waited for the Alpha female,Emily, to go first.